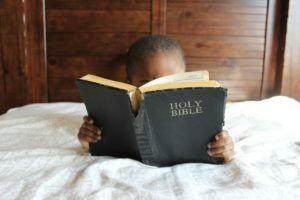 Do Your Kids Trust God’s Word? I (Joey) was in a store buying a new piece of electronics and I had some questions about it before I purchased it. So I asked the customer service tech my question and he said he wasn’t sure as the box was not clear on it. So he said I will ‘google’ it to find the answer. I thought to myself, do we seek God for answers as easily and the same way as we look things up in google? Today our kids are growing up in such a tech friendly and “immediate gratification” society, I wonder if it’s not easier for people to seek answers from “google” than God. Parents can use google as an opportunity to teach their kids to trust the Lord as much as they trust the things of this world. For instance, at a family dinner (which we highly encourage having on a regular basis) I would ask my kids questions to open up a discussion to make them think and stir their thinking in the right direction. Dinnertime around the table is a great time for intentional discussions during which you can guide them towards Godly thinking or someone else will guide them towards their thinking. In today’s fast paced social media society, parents need to do this even more. I would ask a question like “Why do you trust what you google on the internet? How do you know what you read on Wikipedia is true? How about Facebook or snapchat or the magazines about celebrities you see at the store checkout lines? During the discussion keep asking them questions to clarify their thinking. Ask your kids if they ever think about looking up something in the Bible, and how they would go about doing this. Ask them if they trust what the Bible says to be true and trustworthy. Ask them if they believe they should follow what the Bible says on how to live and why. Don’t let one child dominate the discussion. When you ask a question, start it with a child’s name. Ask them if they put as much faith in what they read in the Bible as they would in what they google on the internet. Ask them what they would believe more, what they read on the internet or in the Bible? Your goal is to get them to trust what they read in their Bibles more than what they read on social media or on the internet. I was surprised when I read data from “The Jesus Survey”, a 2010 survey of 800 teens who attended evangelical Christian churches across the US who went on mission trips. The following are the statements in the survey and the responses they got. The Bible is 100% accurate –historically, factually, and theologically – and therefore completely trustworthy in what it says about Jesus. The Bible, though generally accurate, contains some widely acknowledged errors and can’t be completely trusted in EVERYTHING it says about Jesus. How well do your kids trust God’s word as a way to live their lives? A good Mom’s Notes presentation that could help you with this is “How to Use the Bible in the Instruction and Training of Your Children”. It’s available on CD or MP3 with very helpful notes at the Parenting Made Practical bookstore.